Amendola caught 204 passes in college, including 109 for 1245 yards and six touchdowns as a senior (and adding in 6 for 68 yards and a TD in the Gator Bowl). Undrafted in 2008, he signed with the Dallas Cowboys and spent the entire regular season on the practice squad after being waived. The Eagles signed him to their practice squad for the postseason. He went to training camp with Philadelphia and started the ’09 season on the practice squad until the Rams signed him from there in September. Rams went 1-15 to finish fourth in the NFC West. Amendola had a bigger year in 2010, seeing more action on offense as an effective slot receiver with 85 catches for 689 yards, still returning kicks, and leading the league in all-purpose yards with 2364. However, an elbow injury suffered in the 2011 season-opening game had him spending the rest of the year on injured reserve and he missed another five games due to injury in 2012. 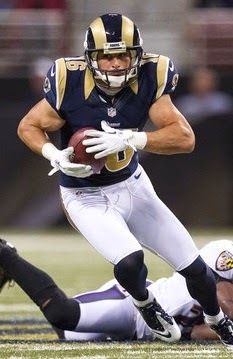 Amendola departed for New England as a free agent in 2013, where it was anticipated that he would help fill in for departed WR Wes Welker, and he had 54 catches for 633 yards while appearing in 12 games. His production declined in 2014 but he became a significant factor in the postseason, which was capped by a touchdown reception in the Super Bowl victory over Seattle. Through 2014, he has caught 277 passes for 2559 yards (9.2 avg.) and 10 touchdowns, averaged 23.6 yards on 138 kickoff returns and 10.2 yards on 106 punt returns. Of those totals, 196 receptions for 1726 yards (8.8 avg.) and seven TDs came with the Rams, where he also averaged 23.5 yards on 118 of the kickoff returns and 10.5 yards on 89 punt returns.